At OCEARCH we aim to explode data sets while handling as few sharks as possible, by maximizing the information we get from each and every shark. We believe scientific collaboration is the best way of achieving this goal. That’s why we take numerous samples from every shark for dozens of institutions worldwide. We also take the opportunity to fit each shark with at least one Smart Position and Temperature (SPOT) tag, a Pop-off Archival Satellite Tag (PSAT), and an acoustic tag. Each device collects data differently and combined they provide a much more complete understanding of the shark’s movements. 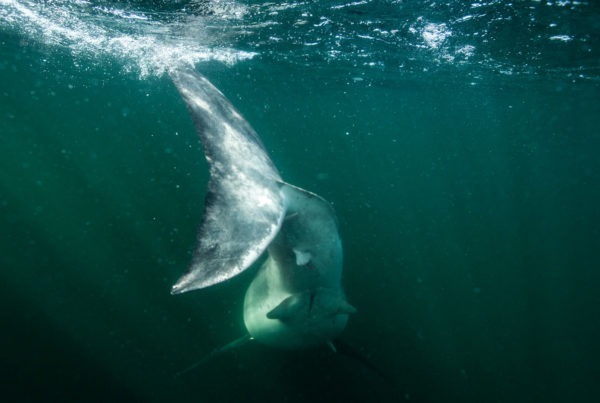 SPOT tags are mounted on the top of the first dorsal fin and transmit the shark’s location to us via satellite whenever the shark’s fin breaks the surface during a period in which a satellite is overhead. The battery on these tags can last up to five years. Acoustic tags are surgically implanted in the abdomen (can also be mounted externally) and communicate the sharks’ presence to receivers stationed on the bottom of the ocean, up and down the coastline. These tags can last up to 10 years. PSAT tags record depth, temperature, and light levels (used for geolocation) and store the data to memory. The tags do not transmit any information while on the shark. 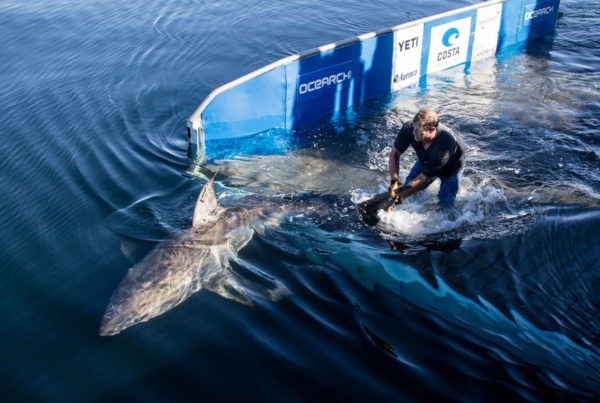 They are instead programmed to detach from the shark six months to a year after attachment, float to the surface and transmit the data to us via satellite. We equip sharks with each of those tags whenever possible because our goal is to handle as few sharks as possible while maximizing the data set. Recently, we captured a shark that already had an external acoustic tag on it, placed there by a different group. 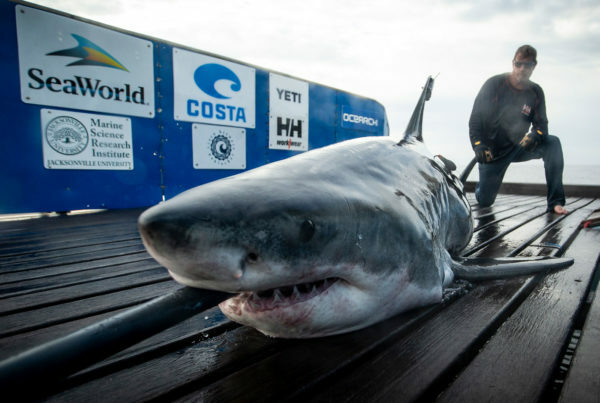 Our team was able to mount a SPOT tag on that shark without disturbing the original tag or its attachment point. We’ve reached out to the scientists who attached the acoustic tag to inform them of this development and open the door for collaboration and data sharing. The SPOT tag we added combined with the external acoustic tag already on the shark will provide a much more complete understanding of the shark’s movements than either device can achieve on its own. Additionally, our team took multiple samples, such as blood, parasite, and tissue, from that shark while it was on the lift. Those samples will support 15 studies by 26 scientists from 19 different institutions.